Community Achievements | Go Chapel Hill! The award is presented only to communities with remarkable commitments to bicycling. The decision involved careful review of an application and consultation with local cyclists. There are four levels of the award – platinum, gold, silver, and bronze. Chapel Hill’s 2019 designation of silver is valid for four years and will then need to be renewed. Other Bicycle Friendly Communities in North Carolina are Carrboro, Durham, Cary, Charlotte, Davidson and Greensboro. Applicants complete a detailed online form with questions in five key areas: engineering, education, encouragement, enforcement, and evaluation/planning. Bergen Watterson, a UNC-Chapel Hill student interning with the Town of Chapel Hill Planning Department, completed the application for Chapel Hill to the national designation program. For more information about the Town’s efforts to increase bicycling in the community, visit http://www.townofchapelhill.org/index.aspx?page=127 or http://www.townofchapelhill.org/index.aspx?page=130 or http://gochapelhill.org. 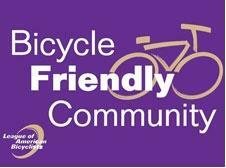 For more information about the Bicycle Friendly Community Program, visit www.bicyclefriendlyamerica.org. Over 200 attended the 2018 National Social Marketing Conference with 13 countries represented in Clearwater Florida but there were only 3 programs recognized for positive impact on the environment through community outreach programming. The Millbank’s Social Marketing Award for Innovation in the Environmental Field is awarded to honor an individual or organization whose social marketing work has profoundly impacted on an environmental or conservation issue, either at a local, national or international level. Use of formative research to understand the presenting problem and views and perceptions of the target audience. Winners were judged on the following. Through the national Association for Commuter Transportation organization, the Town of Chapel Hill’s alternative transportation Go Chapel Hill program, received two national awards. The Go Chapel Hill program received the Outstanding Public Sector Award 2015 and the Marketing & Outstanding Private Sector Award 2015. Both awards focused around the community outreach campaign for families by offering alternative transportation learning to children while working with the caregivers on how to use alternative transportation for getting around town as well as to and from work. Chapel Hill Employee Rides Away with State Title! “I always like to have someone to chase in the sprint,” said the new 2010 North Carolina state road race champion. Unfortunately the women’s filed was sparsely attended even though it was a state championship event. According to Watterson there were a few women that had maybe never raced before and another few that were new to the sport. Watterson said this was a great teaching opportunity for their Performance team. On June 15th, the Town of Chapel Hill was awarded first place for the City Livability Award during the 2009 Mayors’ City Livability Awards Program. Mayor Kevin C. Foy was in attendance and accepted the award on the town’s behalf. Chapel Hill was one of over 200 cities from around the country considered for the award, which is based on three criteria: mayoral leadership, creativity and innovation, and broad impact on the quality of life for residents. The Town won top honors for cities with populations under 100,000 for creating the fare-free transit program. Since its inception in 2002, the fare-free Chapel Hill Transit has increased its ridership from 3 million riders to over 7 million riders annually! The increased ridership has led Chapel Hill Transit to become the second largest transit system in North Carolina! The award recognizes the great effort the community has made to encourage the use of public transportation and reduce the dependency on automobiles. The Town is planning a special community event to celebrate this distinguished award and recognize the contribution of our fare-free system for the community. Event details are being arranged and will be released soon. Congratulations Chapel Hill for this terrific award!